It's been a long time since I was presented with a bottle of snake oil for Christmas. But I was sure that's what Matt have given me as a present. The vaguely medicinal-looking bottle featured an old timey charicature of a eye-patched Snidely Whiplash breathing fire, and promised a "health tonic" and the honest-to-goodness words "cure-all." Clearly, my brother in law was looking to poison me, or help me cure up a case of consumption. It was then that I actually realized what was in the bottle. My mom, who can identify most of the wild plants growing along the roadside, gives several lectures on traditional herbal medicine, along with a range of other horticultural topics focusing on native plants before the pioneers. She was the first one to tell me about the old New England tonic of taking a spoonful of raw honey and a spoonful of raw cider vinegar daily as a ward against colds and flu. 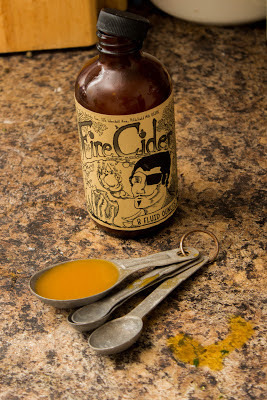 I've written previously on the health effects of vinegar being tied to balancing the body's pH, but never come across Fire Cider. Ultimately, I'm excited to see products like this on the market. It's interesting to see a new generation take up their parents or grandparents traditions and folkways and put a new and personal twist on it. Although I'm still going to need to find something to help with my ague ailment.